هوشمند, پیام, شفیعی, محمدبهشاد, روشندل, رامین. (1396). بررسی تجربی یک سیستم ترکیبی آب شیرین‌کن خورشیدی تبخیری 1،5 لیتری با استفاده از لوله حرارتی و پنل خورشیدی. نشریه پژوهشی مهندسی مکانیک ایران, 19(4), 18-35. پیام هوشمند; محمدبهشاد شفیعی; رامین روشندل. "بررسی تجربی یک سیستم ترکیبی آب شیرین‌کن خورشیدی تبخیری 1،5 لیتری با استفاده از لوله حرارتی و پنل خورشیدی". نشریه پژوهشی مهندسی مکانیک ایران, 19, 4, 1396, 18-35. هوشمند, پیام, شفیعی, محمدبهشاد, روشندل, رامین. (1396). 'بررسی تجربی یک سیستم ترکیبی آب شیرین‌کن خورشیدی تبخیری 1،5 لیتری با استفاده از لوله حرارتی و پنل خورشیدی', نشریه پژوهشی مهندسی مکانیک ایران, 19(4), pp. 18-35. هوشمند, پیام, شفیعی, محمدبهشاد, روشندل, رامین. بررسی تجربی یک سیستم ترکیبی آب شیرین‌کن خورشیدی تبخیری 1،5 لیتری با استفاده از لوله حرارتی و پنل خورشیدی. نشریه پژوهشی مهندسی مکانیک ایران, 1396; 19(4): 18-35. در این مقاله به بررسی یک نوع آب شیرین‌کنخورشیدی تبخیری به منظور شیرین سازی آب‌شور پرداخته شده است. از اهداف اصلی این مقاله ساخت تجربی دستگاه آب شیرین‌کن با بهره گیری از فناوری های پنل خورشیدی و لوله حرارتی همزمان در یک سیستم می باشد، ظرفیت تولید آب شیرین 1،5 لیتر در روز و توان پنل خورشیدی 80 وات می‌باشد. با توجه به بازده پایین تبدیل انرژی خورشیدی به الکتریکی توسط سیستم فتوولتاییک، انرژی تلف شده در این سیستم توسط لوله حرارتی بازیابی می‌گردد تا علاوه بر کاهش دمای صفحه فتوولتاییک سبب افزایش راندمان آن شود. ]1[ مجید بازرگان، مریم احمدی، "تولید آب شیرین با استفاده از سرمایش زیرزمینی هوای مرطوب و انرژی خورشیدی"، دو فصلنامه علمی تخصصی انرژی های تجدیدپذیر، شماره اول، بهار (1393). Rosegrant, X., Cai, M.W., and Cline, S.A., "World Water and Food to 2025: Dealing with Scarcity", International Food Policy Research Institute, (2002). International Energy Agency-the Energy Technology Systems Analysis Programmed, The International Renewable Energy Agency, "Water Desalination using Renewable Energy, Technology Brief", March (2012). "Renewable Energy Desalination: An Emerging Solution to Close the Middle East and North Africa’s Water Gap", The World Bank, MENA Development Report, (2012). Zakharchenko, R., Licea-Jime nez, L., Perez-Garci, S.A., Vorobiev, P., Dehesa-Carrasco, U., Perez-Robels, JF., and et al., "Photovoltaic Solar Panel for A Hybrid PV/Thermal System", Sol Energy Mater Sol Cell, Vol. 82, pp. 253–261, (2004). Ji, J., Lu, J.P., Chow, T.T., He, W., and Pei, G., "Hybrid Photovoltaic and Thermal Solar Collector Designed for Natural Circulation of Water", Appl Energy, Vol. 83, pp. 199–210, (2006). Chow, T.T., Pei, G., Fong, K.F., Lin, Z., Chan, A.L.S., and Ji, J., "Energy and Exergy Analysis of Photovoltaic–thermal Collector with and without Glass Cover", Appl Energy, Vol. 86, pp. 310–316, (2009). Gomkale, S.D., and Datta, R.L., "Some Aspects of Solar Distillation for Water Purification", Sol Energy, Vol. 14, pp. 387–392, (1973). Garg, H.P., and Mann, H., "Effect of Climatic, Operations and Design Parameters on the Year Round Performance of Single Sloped and Double Sloped Solar Stills under India Arid Zone Conditions", Sol Energy, Vol. 18, pp. 159–164, (1976). Al-Hinai, H., Al-Nassari, M.S., and Jubran, B.A., "Effect of Climatic, Design and Operational Parameters on the Yield of a Simple Solar Still", Energy Convers Manage, Vol. 43, pp. 1639–1650, (2002). El-Sebaii, A.A., "Effect of Wind Speed on Active and Passive Solar Stills", Energy Convers Manage, Vol. 45, pp. 1187–1204, (2004). Voropoulos, K., Mathioulakis, E., and Belessiotis, V., "Experimental Investigation of A Solar Still Coupled with Solar Collectors", Desalination, Vol. 138, pp. 103–110, (2001). Tiwari, G.N., Dimri, V., Singh, U., Chel, A., and Sarkar, B., "Comparative Thermal Performance Evaluation of an Active Solar Distillation System", Int. J. Energy Res, Vol. 31, pp. 1465–1482, (2007). Kumar, Sh., and Tiwari, A., "Design, Fabrication and Performance of a Hybrid Photovoltaic/Thermal (PV/T) Active Solar Still", Energy Conversion and Management, Vol. 51, pp. 1219–1229, (2010). Kabeel, A., and El-Agouz, S., "Review of Researches and Developments on Solar Stills", Desalination, Vol. 276, pp. 1–12, (2011). Gang, P., Huide, F., Tao, Zh., and Jie, J., "A Numerical and Experimental Study on a Heat Pipe PV/T System", Sol Energy, Vol. 85, pp. 911–921, (2011). Gang, P., Huide, F., Jie, J., Tin-tai, Ch., and Tao, Zh., "Annual Analysis of Heat Pipe PV/T Systems for Domestic Hot Water and Electricity Production", Energy Convers Manage, Vol. 56, pp. 8–21, (2012). 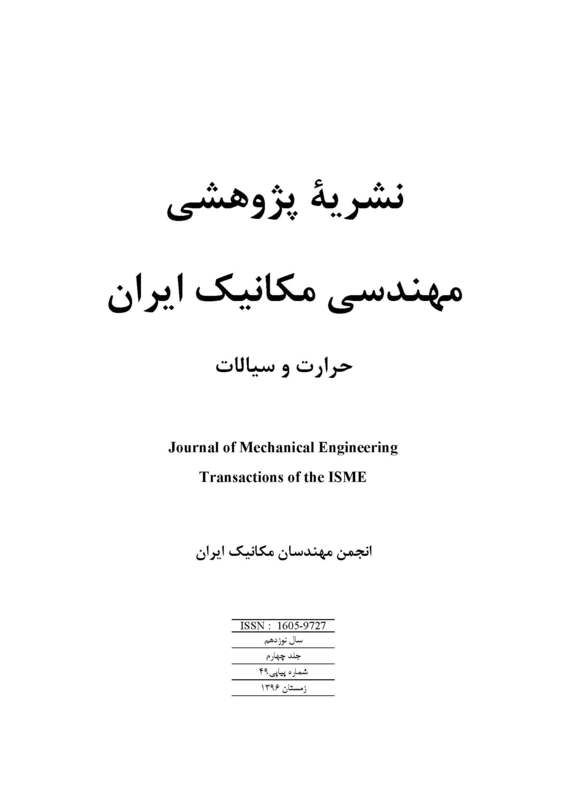 Jahangiri Mamouri, S., Gholami Derami, H., Ghiasi, M., Shafii, M.B., and Shiee, Z., "Experimental Investigation of the Effect of using Thermosyphon Heat Pipes and Vacuum Glass on the Performance of Solar Still", Energy, Vol. 75, pp. 501-507, (2014). Aboul-Enein, S., El-Sebaii, A.A., and El-Bialy, E., "Investigation of a Single-basin Solar Still with Deep Basins", Renew. Energy, Vol. 14, pp. 299–305, (1998). Singh, A., Tiwari, G., Sharma, P., and Khan, E., "Optimization of Orientation for Higher Yield of Solar Still for a Given Location", Energy Convers Manag, Vol. 36, pp. 175-181, (1995). Kargar Sharif Abad, H., Ghiasi, M., Jahangiri Mamouri, S., and Shafii, M., "A Novel Integrated Solar Desalination System with a Pulsating Heat Pipe", Desalination, Vol. 311, pp. 206-210, (2013). Dwivedi, V., and Tiwari, G., "Comparison of Internal Heat Transfer Coefficients in Passive Solar Stills by Different Thermal Models: An Experimental Validation", Desalination, Vol. 246, pp. 304-318, (2009). Rahbar, N., and Esfahani, J., "Experimental Study of a Novel Portable Solar Still by Utilizing the Heat Pipe and Thermoelectric Module", Desalination, Vol. 284, pp. 55-61, (2012). Tiwari, G., Shukla, S., and Singh, I., "Computer Modeling of Passive/Active Solar Stills by using Inner Glass Temperature", Desalination, Vol. 154, pp. 171-185, (2003). Jafari Mosleh, H., Jahangiri Mamouri, S., Shafii, M.B., and Hakim Sima, A., "A New Desalination System using a Combination of Heat Pipe, Evacuated Tube and Parabolic through Collector", Energy Conversion and Management, Vol. 99, pp. 141–150, (2015). Giwa, A., Fath, H., and Hasan, Sh., "Humidification–dehumidification Desalination Process Driven by Photovoltaic Thermal Energy Recovery (PV-HDH) for Small-scale Sustainable Water and Power Production", Desalination, Vol. 377, pp. 163–171, (2016).